This oceanfront condo with breathtaking bay view is located on the property of Camino Real Zaashila hotel, a well-established brand in Mexico. This particular hotel received numerous awards, and has been rated as one of the best in Mexico by Conde Nast Traveler. 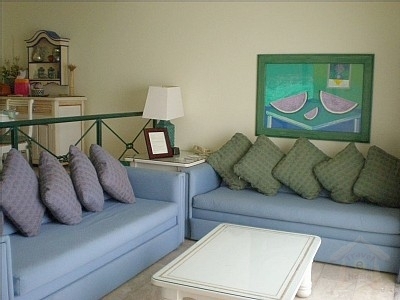 The condominium is furnished and managed by the hotel. It is very clean and it is maintained in a very good condition. The condo guests enjoy the same privileges as the hotel guests including access to all of the hotel amenities: 1,300 feet (400m) long private sand beach, four fine restaurants, three bars, two swimming pools, a tennis court, a gymnasium, and a massage room. - Dry Cleaning & Laundry. The condo is located on the third floor. It has its own private splash pool. In addition, there are two swimming pools at the hotel: one is a 400 feet long free form pool by the beach, and a square pool by the Club de Playa restaurant, also on the beach. Walk from the condo to the beach and to the pool takes about four-five minutes. Huatulco is the fifth and newest resort developed by Fonatur, the Mexican National Trust Fund for Tourism Development. It is an ecological preserve and the first community in the Americas and third in the world to achieve the Green Globe status. There is no sewage going into the ocean. The resort is stretched over nine bays and 36 beaches along the shores of the Pacific. Some of these bays are only accessible by boat. The sands are white and the water pristine. Huatulco is blessed with good weather - 320 to 340 days of sunshine a year and an annual average temperature of 28 degrees Celsius (82 F). Trip Advisor honored Huatulco with the #6 position on its 2010 List of Top 10 Beach & Sun Destinations in the World. For more information and photos please visit our web site at: www.mexicodreamvacation.com. 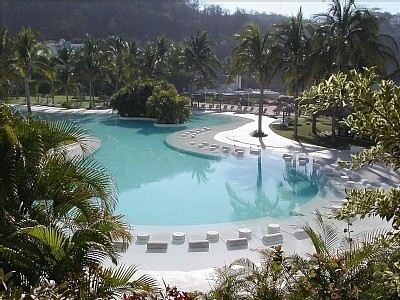 Huatulco is the fifth and newest resort developed by Fonatur, the Mexican National Trust Fund for Tourism Development. 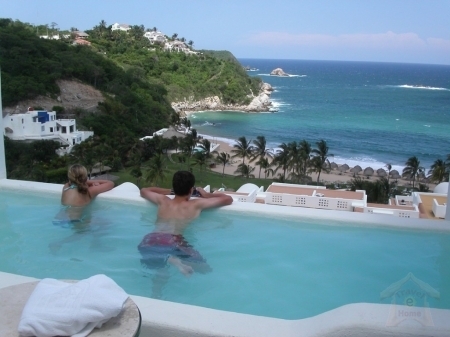 Huatulco is situated in the state of Oaxaca, 240 nautical miles south of Acapulco. It is 277 km south of the state capital, Oaxaca City, and is only a 50-minute flight from Mexico City. The area is called Bahias de Huatulco as it covers nine bays and 36 beaches along the shores of the Pacific. Some of these bays are only accessible by boat. The sands are white, the waters pristine. The tourist resort area of Huatulco is built up around the three bays of Santa Cruz, Chahue and Tangolunda. Tangolunda Bay is home to luxury hotels in the area. Playa La Entrega (The Surrender) â�¢ This beach is where the Italian sailor Francisco Picaluga betrayed General Vicente Guerrero. The 600\' beach is the southernmost of the Santa Cruz beaches and is good for swimming and diving. Wave action varies from calm to moderate at different places along the beach. Accessible by land and boat. Playa Yerbabuena (mint) â�¢ This small, quiet beach is located on the western shore of BahÃ­a de Santa Cruz, north of Playa La Entrega. Accessible by boat. Moderate waves. Playa Santa Cruz (cross) â�¢ Located in Santa Cruz, this 800\' long beach features calm waters, coral, sea shells, and lots of fish life. A good place to snorkel or scuba, but watch out for sea urchins and moray eels. Small underwater cave. Restaurants, equipment rental, and boat rides available. Playa Chahue â�¢ 2000\' long, sloping beach with moderate waves located east of Santa Cruz. For experienced swimmers. Playa Esperanza (hope) â�¢ 400\' long, strong waves, east of Playa Chahue. Not recommended for inexperienced swimmers. Playa El TejÃ³n (badger) â�¢ 400\' long with moderate waves, located east of Playa Esperanza. Playa Consuelo (consolation) â�¢ A small, 250\' beach with moderate waves west of BahÃ­a Tangolunda. Accessed by boat. Playa El Arrocito â�¢ A small, 300\' beach with small waves and shallow depth located just west of BahÃ­a Tangolunda. Accessed by boat. Playa Ventura, Playa Manzanillo (apple), & Playa Tornillo (bolt) â�¢ These three beaches are located together on the western shore of BahÃ­a Tangolunda at the Club Med. They total about 600\' in length with calm waves. Good for swimming, snorkeling and all aquatic sports. Playa Tangolunda â�¢ Camino Real Zaashila and the golf course are located on this 1/2-mile long beach. The beach may also be accessed through Tangolunda Park, west of the hotels. Swimming, diving, and all watersports available. Playa RincÃ³n Sabroso (pleasant corner) â�¢ Located west of Tangolunda, 800\' long, moderate waves. Swimming snorkeling and all aquatic sports. Playa La Mixteca (name of an indian tribe) â�¢ Small beach near the mouth (east side) of Tangolunda Bay. Conejos Bay is located east of Tangolunda Bay. Playa Tejoncitoo (badger) â�¢ Located at the western edge of Conejos Bay, 300\' gently sloping beach, calm waves, shallow depth. For swimming, snorkeling, diving, and fishing. Accessible by boat. Seafood and sodas available during the busy season. 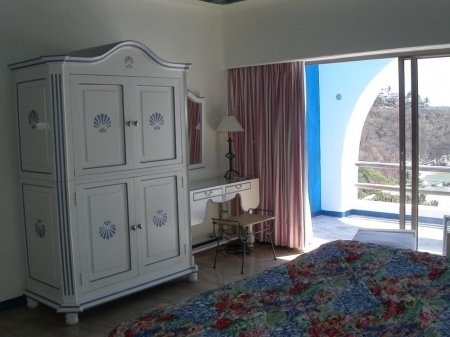 Playa Arena (sand) â�¢ Located east of Playa Tejoncito, 300\' long, sloping beach with strong waves. For swimming, snorkeling, diving, and fishing. Accessible by boat. Seafood and sodas available during the busy season. Playa Punta Arena (sandy point) â�¢ East of and adjacent to Playa Arena and centrally located in Conejos Bay. About 1/2-mile long, sloping beach with strong waves, not recommended for inexperienced swimmers. Accessible by boat. Seafood and sodas available during the busy season. Playa Conejos (rabbits) â�¢ At the eastern end of Conejos Bay, 1/4-mile long, fine white sand, shallow out to 50\' from shore, then having rocky formations. Playas Cuatonalco, Boca Vieja, Ixtapa, Coyote â�¢ These beaches all have similar characteristics. They are more than 10 miles from Santa Cruz by boat. To reach Cuatonalco and Boca Vieja (old river mouth) by land, follow the dirt road that intersects the coastal highway (200) at the Rio Coyula bridge 4 miles west of the Huatulco airport. To reach Ixtapa and Coyote, take the dirt road that intersects the coastal highway at the same point as the road to Santa MarÃ­a Huatulco which is just west of the airport. The beaches face directly on the ocean. Each beach is about a mile in length with sloping fine white sand, and strong waves. Not recommended for inexperienced swimmers. Playa San AgustÃ­n â�¢ About 1-mile long, calm waves, gentle slope, shallow depth, much coral, restaurants serving fresh seafood. Excellent for snorkeling and diving. Accessible by land by taking the dirt road that intersects the coastal highway at the same point as the road to Santa MarÃ­a Huatulco which is just west of the airport, or by boat from Santa Cruz. Playa Cacaluta â�¢ Located in San AgustÃ­n Bay northeast of Playa San AgustÃ­n, 700\' long, gently sloping, shallow depth. Excellent for snorkeling. Accessible by land by taking the dirt road that intersects the coastal highway at the same point as the road to Santa MarÃ­a Huatulco which is just west of the airport, or by boat from Santa Cruz. Swimming, snorkeling, diving, fishing, water skiing. Playa Chachacual â�¢ 3/4-mile long, sloping beach, moderate waves, accessible by boat. Not recommended for inexperienced swimmers. Swimming, snorkeling, diving, fishing. Playa La India â�¢ Located in Cchachacual Bay, 1/4-mile long, fine white sand, accessible by boat. Swimming, snorkeling, diving, fishing. Playa Jicaral (cuplike) â�¢ Located west of Chachacual Bay, 150\' long, moderate waves, fine white sand moderately sloping with small rocky formations. Swimming, snorkeling, diving, fishing. Playa Riscalillo â�¢ Fine white sand, gentle waves, shallow depth. Swimming, snorkeling, diving, fishing. Access by boat, located 30 minutes southwest of Santa Cruz. Playa Cacaluta (black eagle) â�¢ About 1/2-mile long, coarse white sand, accessible by boat or ATV. Swimming, snorkeling, diving, fishing. 300\' offshore is Cacaluta Island, a small rocky island, around which divers can explore coral reefs at depths to 80\'. Playa Maguey â�¢ 1/4-mile long, accessible by boat and land, calm waves on the east end, moderate on the west end. Good swimming and snorkeling. Further out, Punta Maguey is good for scuba diving with walls and caves. Playa Organo â�¢ 800\' long, moderate waves, accessible by boat, land access is difficult. Swimming, snorkeling, diving. Seafood and sodas available during the busy season. 50 minutes flight from Mexico City. Direct daily Continental frights from Houston, TX. A number of charter flights from several US and Canadian cities. Any time of the year. The area boasts 320 to 340 days of sunshine a year and an annual temperature of 28 degrees Celsius (82 F). However, if you prefer a little cooler temperature, November - February would be your choice.